Live daily sessions - SportAccord World Mind Games | Uniting seven federations of the traditional mind sports : Chess, Bridge, Draughts, Go and Xiangqi with over 500 National Associations and close to one billion players. 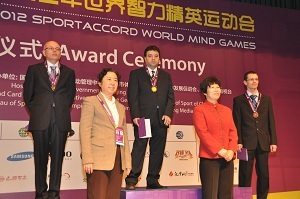 During the 2nd SportAccord World Mind Games, you will be able to follow your sport live. You will find each day a link on this site. Below you will find a document where there are direct links for each day, and for those of you who are webmasters, you will find a link that can be embedded into your web page so that you can show the video from within your own site, and we would be very grateful if you could post that.